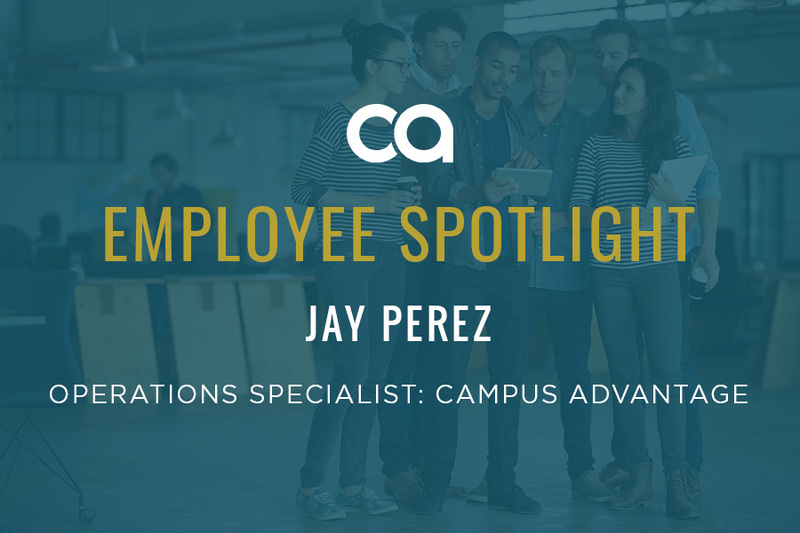 Jay Perez keeps his suitcase by the door in his role as an operations specialist for Campus Advantage — and he likes it that way! Traveling to various properties to solve challenges on-site, his role is all about being flexible, keeping systems and processes uniform with Campus Advantage’s high standards, and adapting to challenges. Jay, like the Campus Advantage work culture, is both parts diligent and fun. Fitting, then, that “Hakuna Matata” is his life motto — what better tune for a problem solver than that? HOW LONG HAVE YOU WORKED AT CAMPUS ADVANTAGE? I’ve been working at Campus Advantage since January 2015, so just over three years. HOW WOULD YOU DESCRIBE WHAT YOU OR YOUR TEAM DO? Being an operations specialist is really a traveling role. My team and I receive an assignment and we head to wherever that property is located and work with the property team. Sometimes, we’re given a task list, and other times, we’re asked to go after an issue and just solve it. HAVE YOU HELD ANY PREVIOUS ROLES AT CAMPUS ADVANTAGE? 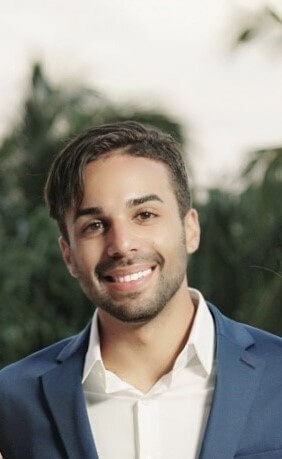 I started as a leasing manager at Tobin Lofts in San Antonio, Texas, then became an assistant general manager and eventually the general manager at One Easton in Newark, Delaware. I’ve been in my current role since March of 2017. WHAT FIRST ATTRACTED YOU TO WORKING FOR CAMPUS ADVANTAGE? Before I joined Campus Advantage, I was working at a bigger company where employees were viewed more as a number and not a person. I had a friend who worked for Campus Advantage and loved the culture and how everyone had their opinions heard. And that has definitely been my experience — opinions are not only heard, but asked for, on a frequent basis, to improve the company, our culture, and individual properties. WHAT THREE WORDS BEST DESCRIBE YOU (INSIDE OR OUTSIDE OF WORK)? Funny -At least I think so! IF YOUR LIFE HAD A SOUNDTRACK, NAME ONE SONG THAT WOULD BE ON IT. Hakuna Matata from the Lion King. On a day-to-day basis, you can’t take things too personally or too seriously — you have to take it one step at a time and try not to worry. Also, it’s important to have fun! IF YOU HAD TO CHOOSE ONE COMPANY VALUE THAT BEST REPRESENTS YOU, WHAT WOULD IT BE AND WHY? I would say MOJO [the secret sauce of fun, charisma, and charm that is at the heart of Campus Advantage’s culture]. I’m very much about making sure everyone feels included and is having a good time while being productive. Work atmosphere has an impact on productivity — if there’s a good atmosphere and people are having fun and feel known, positive productivity naturally follows suite. THINKING OF YOUR MOST SUCCESSFUL PEERS OR TEAMMATES, WHAT CHARACTERISTICS DO THEY SHARE? Persistence and a natural ability to lead. That’s what I look up to specifically in our VP of Operations, Christy Shorter. She makes sure each task gets done. WHAT ARE YOU DOING TO ENSURE THAT CAMPUS ADVANTAGE REMAINS A LEADER IN THE STUDENT HOUSING MARKET? I’m making sure that Campus Advantage has uniformity in operations approach throughout our properties. I have the luxury of visiting different properties and making sure that our high standard is upheld. I want there to be uniformity that others see and easily identify. Sticking true to our brand standards through a set of formalized processes at each property is what creates consistency in the minds of investors, property managers, developers, and residents – and that helps keep us at the top of our game. WHAT MOTIVATES YOU TO GO THE EXTRA MILE? The fact that I know going that extra mile won’t go unnoticed. Everyone will always appreciate that extra step or mile, no matter how big or small. Work is never in vain, which keeps me motivated.